Histcarp are fish that can be caught in ponds, lakes, and other bodies of water. 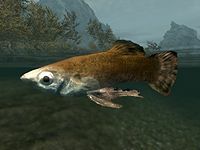 They are one of only three ingredients in the base game with a Waterbreathing effect; however, the Hearthfire add-on adds two more: Hawk's Egg and Salmon Roe. Fish barrels have a 25% chance of containing histcarp.